One of the first things I think about when it comes to eating healthy is salad. To me, it embodies an easy way to pack in lots of the nutrition you need in one meal. While a salad might be an easy thing to eat to stay healthy, the hard part is finding good restaurants that serve salads in a college town. A lot of students find themselves opting for faster and cheaper options for meals, which can result in poor dietary choices. 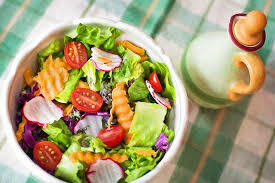 Luckily, there are some great places in Madison that offer healthy salads that are perfect for a busy college student. Salads Up is like the Chipotle of salads. You have the freedom to pick and choose ingredients and make the perfect salad. There’s also a bunch of different other food options to pair with your salad, such as smoothies, acai bows, and more. Similar to Salads Up, Forage allows you to customize your salad or bowl. You can also order off a set menu of salads, as well as acai bowls and cold press juices. Forage is known for their healthy ingredients and delicious salads. Carte can be found in the Wisconsin Union. It is somewhat hidden and less well known, but the line is still almost out the door everyday. The salads from Carte are extremely tasty, and the best part is its proximity to all the study spots. I always pick up a salad from here and bring it with me to the surrounding libraries to get me through a day of studying. Last but not least, Roast is a class restaurant for UW students. Instead of ordering a sandwich or mac n cheese, order one of their tasty salads instead. You won’t be disappointed!